Oh, vérité documentaries on people doing history today. Now I get it. That reminds me, there’s a penetrating exposé on age disparities in American relationships that I need to TiVo. Despite being buried in work, I managed to catch part of The History Channel’s new mini-series. “America: The Story of Us” is a panorama of four centuries of the nation’s past, the first time in decades that such a project has been undertaken for television. It’s a very worthy and ambitious effort, and I’m glad to see the network tackling something like this. As I’ve said before, The History Channel can turn out some pretty good original programming when they tear themselves away from aliens, secret societies, and lumberjacks. One thing that puzzled me, though, was the conspicuous absence of historians among the on-air commentators. For the segment on the origins of the Revolution, the talking heads included Tom Brokaw, Brian Jennings, Colin Powell, Michael Bloomberg, and another fellow identified as a military expert and ex-Navy SEAL. I’m not referring to the narration, mind you, but to the snippets of unscripted commentary interspersed throughout the program, which usually consists of excerpts of interviews with experts in the subject matter. Still, I can’t imagine why you’d hire a TV news anchor to provide insight during a documentary on early American history. None of these off-the-cuff remarks cast any real light on the material. They were the sort of fluffy, vague, sentimental filler that my students tack onto their essay exams when they’ve run out of anything meaningful to say. Every single interview segment that I saw could have been left on the cutting room floor with no loss whatsoever. It seemed for all the world like one of those pop culture shows which feature snippets of comedians and D-list celebs commenting on old music videos or offbeat news stories. They’re on the show because they’re recognizable and because they have the gift of gab, not because they’re bringing any expertise to the table. Think “I Love the ’80’s” with a different set of eighties. I hope the series succeeds. It’s got serious potential, and it’s the kind of large-scale, meaty project that a lot of history buffs would love to see the network do more often. It seems to me, though, that this approach to on-air talent is a misfire. It seems George Washington checked out two books from the New York Society Library that were due back on November 2, 1789. He never returned them. Keep an eye out for the mother of all yard sales at Mt. Vernon. 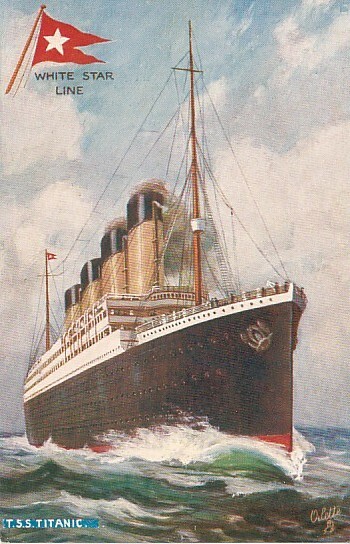 It’s the anniversary of the Titanic‘s collision with an iceberg; she struck it near midnight and went down in the wee hours of the following morning. Coincidentally, the newest addition to our roster of historical to-dos here in East Tennessee is a “Titanic museum attraction,” which opened about a week ago in Pigeon Forge. Pigeon Forge, TN is situated right in the Smokies, and is therefore quite thoroughly landlocked. In fact, Pigeon Forge is probably the second-to-last place in the world where one would expect to find a “Titanic museum attraction.” The very last would be Branson, MO, but they’ve already got one. If you took an idyllic setting on the edge of the Great Smoky Mountains National Park and then filled it with mini-golf courses, outlet malls, go-cart tracks, country music theaters, bungee jump platforms, helicopter tours, dinosaur boat rides, Chinese acrobat shows, and souvenir shops; slapped a theme park named for Dolly Parton right smack in the middle; and then added the worst bumper-to-bumper traffic to be found outside of Los Angeles, then Pigeon Forge would be the result. Don’t get me wrong; you can have a very good time in Pigeon Forge. I myself have spent many enjoyable hours there, although let me state right here and now that the Jurassic Jungle Boat Ride is a complete and utter rip-off. My point is that putting a museum in the middle of all that kitsch is sort of like hanging an original Rembrandt in a Las Vegas casino. It would be like building a museum in…well, Branson or Orlando. But it’s now been done, and not only that, but the master of ceremonies at the grand opening was—I kid you not—Regis Philbin. This is the very man one would want to open a major museum, a man who positively oozes historical sensibility and scholarly gravitas, much like David McCullough or Daniel Boorstin. One thing the Branson Titanic has going for it that our Volunteer State version lacks is a pair of live spaniels. The website promises that they will “star in our upcoming 2010 salute to the Dogs of Titanic, the world’s first tribute to the 10 dogs known to be on board.” I’m surprised that we’ve gone nearly a century without a tribute to the dogs on the Titanic, but you know how it goes with historical commemoration and disfranchised minorities. The spaniels have their own webcam, in fact, although they weren’t hanging around in their doggy suite when I checked in. It seems to me that the folks at the helm of this ship have left “museum” in their wake and are heading toward “attraction” at full steam. Plenty of historical bloggers have weighed in on VA Gov. Bob McDonnell’s proclamation of Confederate History Month and his subsequent apology for omitting slavery from it: Kevin Levin, Brooks Simpson, Robert Moore, and Richard Williams, for instance. 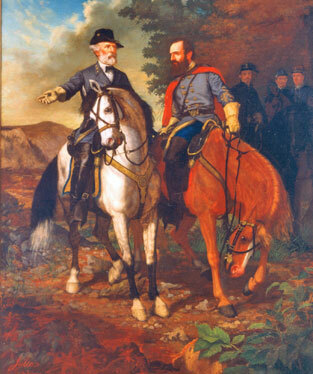 The last meeting of Robert E. Lee and Stonewall Jackson, two eminent Virginia Confederates, on May 2, 1863. From Fredericksburg & Spotsylvania National Military Park's website. These historical dust-ups normally don’t spill over into more general-purpose news sites, but this one has done just that. The Washington Post‘s Virginia Politics blog has devoted several posts to the subject. Even more interesting is this post from the same paper’s political analysis blog, on whether McDonnell’s gaffe will cost him a position on a national ticket. The blogger plays it down, but the fact that people are raising the question at all tells us something about the way we’re remembering the Civil War nowadays. Confederate history, it seems, is quite the political liability. This item on the Post blog states that the Sons of Confederate Veterans requested that McDonnell issue the proclamation, and notes that an SCV spokesman “said the governor’s stamp of approval would help the group publicize the month and aide [sic] tourism efforts in the state.” I didn’t know the SCV was in the tourism promotion business, and I don’t see why a proclamation of “Virginia Civil War History Month” wouldn’t have accomplished the same thing. In any case I don’t see how a gubernatorial proclamation of any sort would increase visitation to museums and historic sites. This sort of thing strikes me as a case of giving lip service to promoting historical awareness and heritage tourism with nothing to back it up. Having perused a list of the governor’s official proclamations on his website, I’m not convinced that being the subject of one is anything to write home about. For instance, in addition to naming April Confederate History Month, McDonnell has also proclaimed the same month to be Financial Literacy Month. March is pretty busy, with Mediation Month, Kidney Day (note the stirring section following the first “WHEREAS” on that one), Governmental Purchasing Month, and Tornado Preparedness Day. Rest assured that if by some remarkable coincidence a tornado had struck Virginia on March 16, 2010, her citizens would have been thoroughly ready for it. And Virginians of all ages were no doubt wetting their pants in anticipation of Congenital Heart Defect Awareness Week back in February. If the SCV is so concerned about promoting Virginia history, then let them lobby their state officials to beef up funding for historic sites, the state historical society, and so on. That would take good deal more effort than convincing the governor to issue a simple proclamation, but it would do far more good. Similarly, if the governor wants people to visit his state’s many wonderful historic destinations, he’s in an excellent position to do something about it—but I think a proclamation will do very little toward that end. Let him take active steps to strengthen historical interpretation and preservation in the state which he runs. Let him present a budget to the legislature with robust allowances for the state agencies which serve as caretakers of Virginia’s history. Let him pledge not to lay off the people who work for these agencies, as so many state executives have done. Let him implement sincere measures to make Virginia’s historic destinations the centerpiece of the state’s tourism initiatives. I don’t think the proclamation of Confederate History Month did either harm or good to the cause of promoting Virginia’s Civil War past. In fact, I don’t think it has done much of anything, except make a lot of people very upset. Looks like city officials in Fredericksburg are finding out how much fun public commemoration can be. Might want to dot all those i’s next time, fellas. Let me encourage those of you who are interested in the American Revolution, historical memory, or the mountain South to pick up a copy of the Fall 2009 issue of Tennessee Historical Quarterly, which is just now off the press. The first article is by yours truly, based on some of the research I did for my master’s thesis. I’m very honored to have some of my work in THQ. In this piece, I examine some nineteenth-century accounts of the Battle of King’s Mountain by historians, antiquarians, and orators to explain how some of the popular traditions about this event developed. The battle was undeniably significant for a number of reasons, but today it’s especially important in the history of the Tennessee mountains. I argue that many of the popular notions we have about the battle’s relationship to Appalachian Tennessee can be traced back to re-tellings of the late 1800’s, a time when there was great interest in the region’s Revolutionary-era past. On a related note, check out the latest of Gordon Belt’s series of posts on John Sevier. Before he became Tennessee’s first governor, Sevier was one of the backcountry militia officers who planned and commanded the expedition that ended with the Whig victory at King’s Mountain. Gordon looks at the movement of Sevier’s remains from Alabama to Tennessee in the late 1880’s, during the same wave of remembrance and regional pride I discuss in my article. I’m looking forward to his further posts on this fascinating historical figure.